President David Granger said that Guyana looks forward to a single, legally-binding successor to the Cotonou Agreement that will open a new era in economic relations between the African Caribbean and Pacific (ACP) group and the European Union (EU). He said that this new covenant should aim at enabling the transformation of ACP economies through investments in industries, infrastructure and information communications technology; expanding market access for ACP products and services; and ensuring environmental security, particularly for the ACP’s small-island developing and low-lying coastal states. The Head of State made these remarks this evening at a reception held at the Pegasus Hotel in celebration of Europe Day 2018. “Guyana iterates its commitment to the rule of law, respect for human rights, good governance and democracy – the same values which cement the European Union. 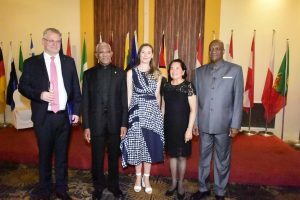 Guyana iterates its commitment to the long-term partnership between the African, Caribbean and Pacific Group and the Europe Union,” the President was quoted as saying in a press statement issued by the Ministry of the Presidency. On June 6, 1975, the Georgetown Agreement was signed in Guyana that marked the conception of the ACP which has enjoyed a long-standing partnership with the EU commencing with the first Lomé Convention of 1975. The Lomé Conventions, were principally, trade and aid regimes. President Granger explained that the Cotonou Agreement, which is the successor to the Lomé Conventions, broadened the scope of this partnership to encompass development cooperation, economic and trade cooperation and political dialogue. The Cotonou Agreement ends in 2020. The Head of State said that Europe Day symbolises the promotion of peace through economic cooperation and integration and expressed his appreciation to the EU for its support in the areas of climate change adaptation, disaster risk-reduction and improved coastal zone management under the 11th European Development Fund (EDF). With regard to protection of the environment, the Ambassador informed the President that the EU is ready to assist Guyana in the implementation of its ‘green’ state agenda and lauded the Government’s recent decision to ban single-use plastic items. He also commended the Government on its efforts at diplomacy, which resulted in the United Nations referring the Guyana-Venezuela border controversy to the International Court of Justice for final resolution. In a video message, High Representative and Vice-President of the EU, Ms. Federica Mogherini said that the EU is more indispensable than ever for citizens, who need economic growth, jobs, security, opportunities and rights. “Our citizens know very well that, in a global world, we can only achieve results if we stand united, as the European Union. The same is true for our partners – all those who want to work in a cooperative way to strengthen multilateralism, peace, sustainable development, free and fair trade, human rights and democracy. United, we stand with you,” she said. Europe Day, observed on May 9 each year, marks the presentation of the Schuman Declaration in 1950, which proposed the creation of a European Coal and Steel Community, the forerunner to the European Union.